Slim fit shirt with suspenders. Make your everyday work apparel fun again in a playful slim fit shirt with suspenders. Features a contrasting black colorblock detail along the shoulders and elbows. The slim fit shirt with suspenders is designed with a front chest pocket, button-down collar, and matte beige buttons. Cuffs are tailored with scalloped corners and dual button closure. The black and white slim fit shirt includes removable black elastic suspenders with a Y-back design and silver metal clips. 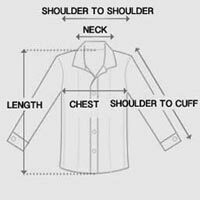 Dress shirt can be worn alone or mix and match with suit accessories. Exude modern finesse in the slim fit button down shirt designed for the chic fashionista. Suspenders included with shirt. I love the shirt, it fits like a glove very nice and sharp.